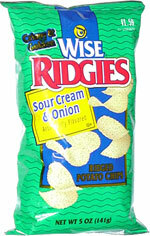 Taste test: These are pretty good narrow-rippled sour cream and onion chips, with a lot of flavoring on them. But Keith says:These have always been too salty for my taste, and they're trying too hard with the sour cream and onion taste. And they're still greasy. Smell test: Mild onion aroma. 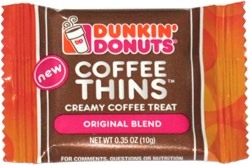 This snack was discovered by Jeremy at Lambert's Rainbow Square, Westwood, Massachusetts.